During my Social Media Training sessions I spend quite a bit of time demonstrating how social media can be used to provide customer support and now that Facebook & Twitter have launched some new tools it’s going to be even easier to provide a great service to your customers on social media. Its being rolled out at the moment and I’ve not found these new features live yet myself but I will be having a play as soon as they land. The first new feature from Facebook is Private Replies. If you receive a support request as a comment on your Facebook page you can now chose to reply to the person as a private message instead of a public reply. This gives you the chance to take things away from the public glare and ask for more private information like email address or phone number. If you use this new feature I would always leave a public message saying something along the lines of “Just messaged you privately so we can sort the issue out quickly” so that the rest of your followers can see how proactive you are on support. 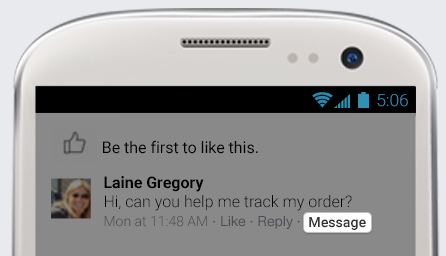 For busy pages with lots of comments these new features are going to save a lot of time. Here’s the Facebook Blog announcement of these new features. The big news from Twitter is that the character limit of 140 has been removed from Direct Messages and I’ve already seen an increase in messages now that a lot more can be said. Customer service on Twitter has always been a bit blunt and direct as there’s not a lot of room to say anything meaningful but now we can be more helpful, ask more questions and confidently take things away from the public glare and deal with issues privately. Don’t forget to head to the security section on Twitter and check “Receive Direct Messages From Anyone”. More and more people are using social media as the first port of call for any questions or grumbles so its really important that all businesses put a strategy in place so they don’t miss these questions and have an easy way to deal with them. My Social Media Training contains a section on Customer Service and how to easily monitor your brands platforms for new questions. Get in touch if you are interested in some training or you can always direct message me on Twitter with any questions.